The world’s most widely planted apple. It has a thin bright red skin with a mildly flavored fine-grained white flesh. Excellent for eating as a snack or in salads. The ultimate baking and cooking apple, also good for fresh eating. It is a very smooth red apple with a slightly juicy flesh. The flavor of this variety grows richer when baked in your favorite recipe. Also available in U-Pick Orchard. An apple with a firm white flesh which retains its shape and rich mellow flavor when baked or cooked. The skin is so tender that it does not require peeling for most recipes. This apple is the one that will stay white longer when cut and therefore is great for salads. Also available in U-Pick Orchard. Attractive pink blush over yellow undertone and sweet-tart flavor. Pink Lady is medium to large with ribbing, or bumpy skin and crisp, firm, cream-colored flesh that resists browning. 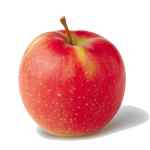 Gala apples are usually medium to smaller in size with a distinctive red and yellow striped heart-shaped appearance. They have a noticeably sweet flavor and aroma and are excellent for kids as a snack. Crispin/Mutsu apples are light green to yellowish white in appearance. 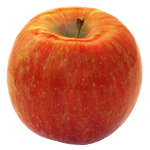 This juicy apple has a sweet, rich, full flavor. Its texture is firm and very dense. Crunchier and tarter than Golden Delicious. 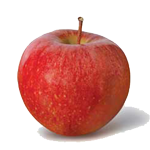 Empire is a McIntosh type apple with longer shelf life and better color and flavor. Aromatic and crisp with creamy white juicy flesh. These apples have a juicy cream-colored to yellowish flesh with a tart, wine-like flavor. They hold up well in storage and are often used as cooking and cider apples as well as for fresh snacks. A Medium-sized apple with a thin, tough skin. A good keeper. Medium size. The yellow flesh is firm, fine-grained, crisp, moderately juicy, and sprightly sub acid in flavor. Best keeper. A sweet, exceptionally crisp-textured apple rated superior to McIntosh and Delicious for fresh eating. Excellent keeper. Fuji is a newer variety with exceptionally sweet flavor. It is becoming a favorite for fresh eating and desserts. Known for holding up well in storage. A dark-red apple discovered in Hendersonville, North Carolina, by William Dalton. King Luscious is a cross between the older Stayman and the Wolf River. Very popular apples light green in color. Crisp, juicy and tart apples often used in baking pies. 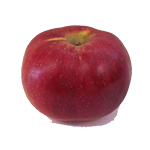 Cortland is a medium-=sized apple with smooth yellowish skin mostly covered with dark red. The fine-grained flesh is very juicy and takes longer to turn brown when exposed to air. Jonagolds are a cross-between a Golden Delicious and a tart Jonathan apple. This juicy, crisp apple with a honey sweet taste with a hint of tartness make them a great eating apple. They are also good for baking and freezing. The Cameo is a firm, crisp, bright red striped apple with a creamy orange color. Similar to Fuji, but harvest about 6 weeks earlier. Tender, juicy Good for baking and drying. 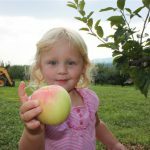 Great cooking apple – good for applesauce and apple butter.